Once there was a boy who loved model trains. When the boy grew up, he became the chief engineer of train exhibitions at the Chicago Botanic Garden—and he still plays with trains. “I hardly get to play with my railroad at home because I get to play with this one,” said Dave Rodelius, in the tone of a man who can’t believe his good fortune. 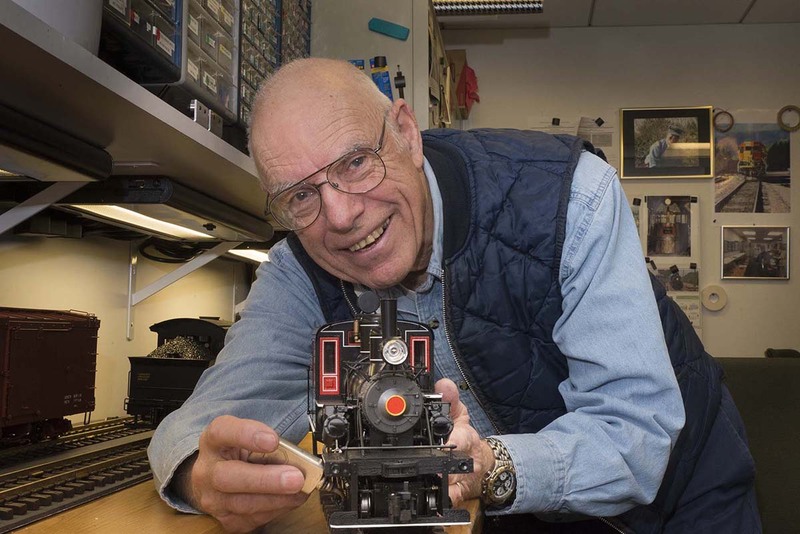 Dave Rodelius shows off one of the stars of the Model Railroad Garden this spring: a steam engine! This year marks Rodelius’s 15th season at the Model Railroad Garden: Landmarks of America, which opens Saturday, May 9, with a special treat. This season, the Model Railroad Garden will pay tribute to steam engines, in honor of the 125th anniversary of the Chicago Horticultural Society (the Society founded and manages the Chicago Botanic Garden). Models of historic steam engines will chug along 1,600 feet of track, representing the early days of the Society, when steam engines ran commuter coaches along Chicago’s elevated tracks and hauled freight over long distances. Q. Dave, you have the greatest job title ever! How did you get this job? A. I was retired, and my wife saw a little blurb in the newspaper that the Chicago Botanic Garden needed tram drivers. So I became a tram driver. One day, I saw that they had torn things up right in the middle of the Garden. I said, “What the Sam Hill are they doing here?” That’s how I found out there was going to be a model railroad out there. Then one of the secretaries, who worked for a vice president, found out that I had been into model railroads all my life. So one day, the vice president of visitor operations at the time called me into her office and asked if I would be interested in managing the railroad. I didn’t get a chance to ask her how much I’d have to pay. 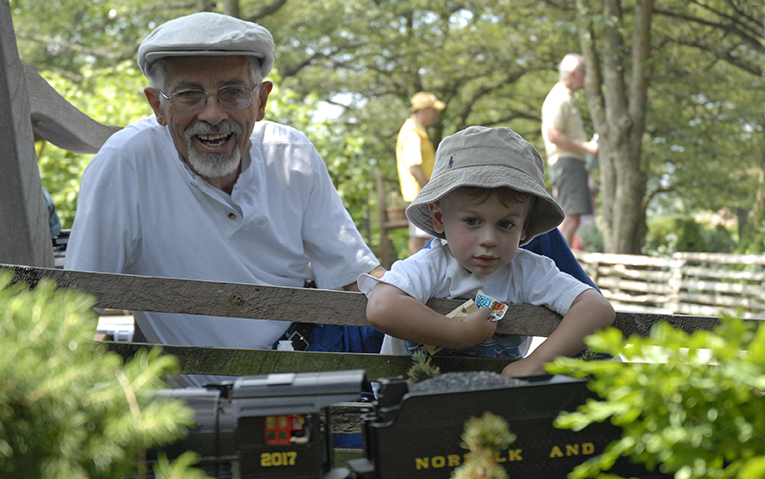 Visitors of all ages enjoy the Model Railroad Garden. Q. But that was back in 2000—and the railroad exhibition was going to be a five-month exhibition. A. We had more than 100,000 people come through in five months. The little path out there was constantly packed with people. One thing led to another. In our first year, the trains didn’t make any sounds—no choo-choos or whistles or anything, so we added sound cars. Gradually, the railroad became so darn popular that it became a permanent exhibition. Q. So you became interested in trains as a kid? A. When I was 6 or 7, my dad bought me a Lionel train. That train would go around the Christmas tree and in the bedroom. Now I have a model railroad layout of Solothurn, Switzerland, where my daughter got married; it’s in my basement. It has Swiss trains and a ski lift. Q. It sounds like you were a busy kid. A. My family had 2.5 acres that we farmed in World War II for vegetables. I sold vegetables in the neighborhood in my little wagon. Then I was in the Boy Scouts and became an Eagle Scout in 1948….I grew up in Evanston and still live in Evanston, and I have lunch with some sixth-grade classmates once a month. Q. And you’ve had some other interesting jobs before you started running the railroad. A. I received a bachelor’s degree in animal science at the University of Illinois. I wanted to raise cattle. In college, I was an intern at a purebred cattle farm. The most fascinating thing I did was to help birth calves. You get to see the little rascals trying to get up and stumble around….Eventually, I was drafted into the U.S. Army engineer corps. Two years later, I was discharged and became a manager at a livestock feed manufacturing company. Then my dad bought a photography studio in 1961, and I became a photographer. Q. What keeps you motivated after all these years? A. My passion for the railroad is what drives me—I absolutely love this railroad. The same passion goes for everyone. 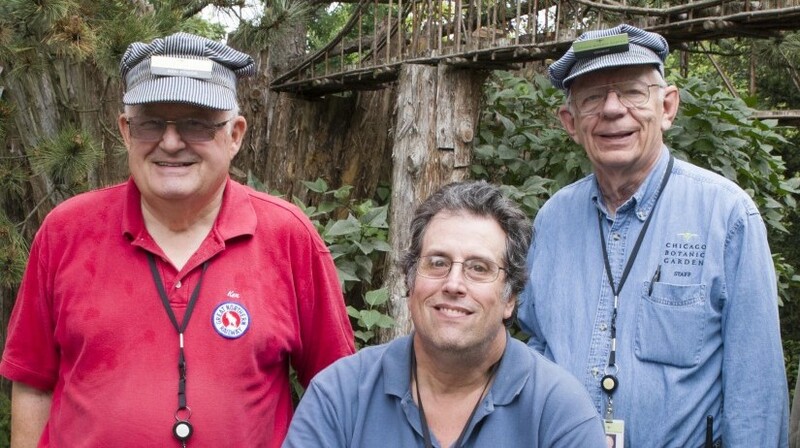 We have 18 engineers and 75 to 80 volunteers. They get along so darn well that I can’t believe it. You cannot keep these people away; they are just so dedicated. They whole thing has kept me young. I get up and down on my hands and knees all the time. I should write to the AARP—if you want to hear about a good job to have, we at the Garden have it. Q. What do you do in your spare time? A. I do some gardening, and some fishing and boating. My wife and I have three daughters and three grandkids. My wife is spectacular, one of the greatest people I’ve ever met.